ActionFilters are a great way to add extra functionality to your Web API service. This article shows examples of how the ActionFilters work together, how the filters can be overrided and how the filters can be used together with an IoC. The diagram underneath shows how the filters are called in the Web API lifecycle. Important! Filters for Web API are not the same as filters for MVC. The Web API filters are found in the System.Web.Http.Filters namespace. To demonstate the different features of action filters, different custom ActionFilters have been defined. Each filter writes to the output window. The controller ActionFilters are wrapped around the action method ActionFilters. This example shows how the framework attribute OverrideActionFiltersAttribute can be used to disable the controller level ActionFilter attributes. This attribute disables all ActionFilters defined at the controller level, but none from the action method. It is not possible to disable a single attribute type! As the results show, no controller level attributes are called. The FilterGroup class defines the override logic. This example is the same as above except a custom override is used. Like before, all controller level attributes are disabled. Note: This attribute only works if the IActionFilter is returned in the FiltersToOverride property. You cannot override your custom action directly. Only groups of filters and in this example, all filters from group IActionFilter are overrided. This example is the same as example 1, except the action method has 4 different ActionFilters defined. As shown in the results, the order of the ActionFilters on the action method is NOT sorted! This example shows how an ActionFilter can be used to change the request data. The data parameter is changed in the pre-processing of the action filter. This is then changed and sent on to the action method and returned to the browser. As shown above, the ActionFilter has intercepted the request data, added the Injected! text to the data and this is sent on to the action method which posts it back to the browser in the response. This example shows how an ActionFilter can be used with base and parent controllers. The behavior is the same as a single controller. The parent controller attributes are decorated around the base controller attributes which are decorated around the action method attributes. The override attribute disables all controller attributes, in the base controller and the parent controller. Override in the parent controller: This has no effect whatsoever. This override is for action methods and not controllers. The System.Web.Http.Filters.ActionFilterAttribute has no order, less events and can’t do as much as it’s cousin! A resolver needs to be implemented to build up filters with the Web Api config when the filter has IoC dependent objects. 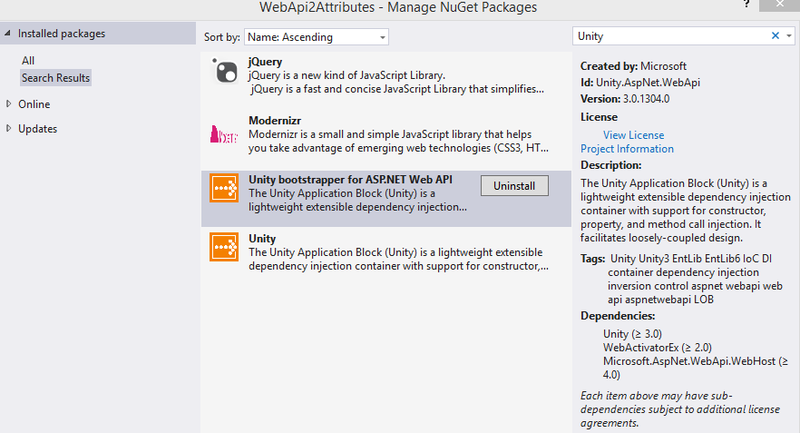 Firstly add Unity Web API Bootstrapper to your project. Now create an ActionDescriptorFilterProvider class which implements the IFilterProvider interface. This will be used to resolve the ActionFilters. Now an attribute can be defined which uses Property Injection. Construction Injection cannot be used because the attribute requires a default constructor. The Dependency attribute from Unity requires that the property is not private. The Unity objects need to be registered with Unity. This is done in the App_Start/UnityConfig class. Now the property injection attribute can be used in the controller. Add when executed, it works as required. How can you facilitate enabling/disabling endpoints in web api2? For example you may want to disable an endpoint on production server but enable it on development server.